wrapping thrifted glass vases with sweaters! and I created some of my own using hot pink and chartreuse green angora sweaters. ...obviously this idea really appeals to me, 'the sweater queen'! you simply cut the sleeve off of a sweater, and slide it over a glass cylinder vase. or scrunch it down like legwarmers for more texture. because it was too wide for a sweater arm to slip over it. though thicker textures work best on larger vases. and thank you to Jen on Social Salutations for featuring this post! Pure genius! Those are really cute! Deb, your creativity knows no end, does it? You continue to surprise us! I think these would make such fun tea cozies, too. I've been wanting one for my endless cups of winter tea but not finding time to make one. But using your sweater idea, I might be able to whip one up. Thank you for sharing with us. LOVE this idea! So cozy! 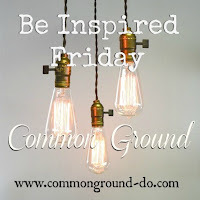 I featured you today in my Friday I'm In Love favorites! What a FUN idea! This is just perfect for winter decorating...thanks for sharing the idea. I saw your post over at "Common Ground". they look all warm and cozy...just adorable! Love your version! I just love this idea. I'm wondering if I could also make a mug warmer using a felted wool sweater. You have given me an idea. Thank you. So very cute, and so very easy to do. Love it!